While the average price for a new digital SLR still hovers around $700 USD, there are several low-cost options out there. Digital SLR cameras are a lot like cars and computers: as soon as a camera is released, its value starts falling. 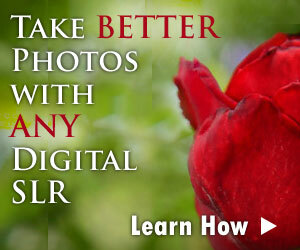 That's why most of the inexpensive digital SLR cameras I list below are several months old. If you absolutely want the latest and greatest digital SLR camera, then you're going to have to pay a bit more to get it. If you'd like to get your feet wet in the world of digital SLR cameras, and really aren't keen on paying a ton of money, then your best bet is to find a camera that's several years old. Older digital SLRs work just fine - mine from 2004 is still plugging along - they just don't have all the latest features like dust control, live view and face-detection autofocus. Since camera technology advances so quickly, many models from just 3 years ago are no longer available new - the only way to get your hands on one is to find one used. The good news for you is that there are plenty of people out there upgrading to new cameras to get the latest features. This means that a quick search of eBay should yield plenty of inexpensive digital SLR cameras for you to choose from. The latest inexpensive digital SLR cameras fall into a category that I call "entry-level". In essence, these are cameras designed for people just migrating from a point-and-shoot compact camera. They work well in full AUTO mode (but can be used manually as well) and they don't offer a lot of customization features that more advanced photographers expect. This lack of customization is actually a benefit if you're a beginning SLR photographer: the camera settings are relatively straightforward and the manual isn't 700 pages long. And now, without further delay, here are some of the least expensive digital SLRs you can get today.